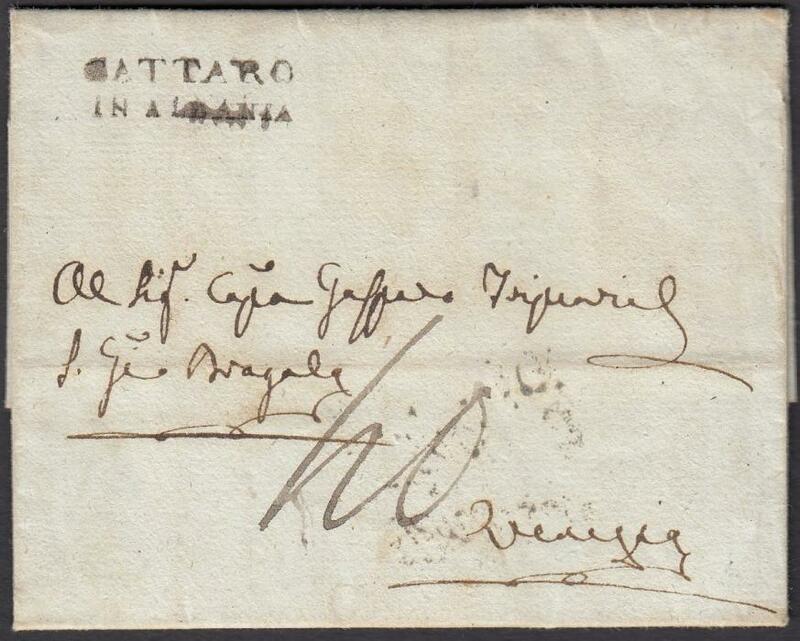 1806 entire from Dobrota bearing fine oval-framed 'CATTARO' handstamp; straight-line arrival backstamp. 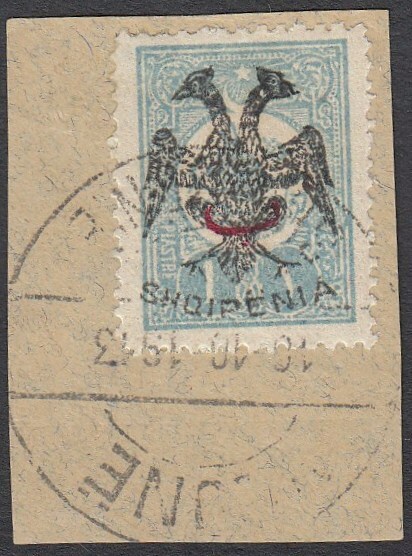 1820 entire bearing good two-line 'CATTARO/IN ALBANIA' despatch handstamp, arrival backstamp; fine and fresh. 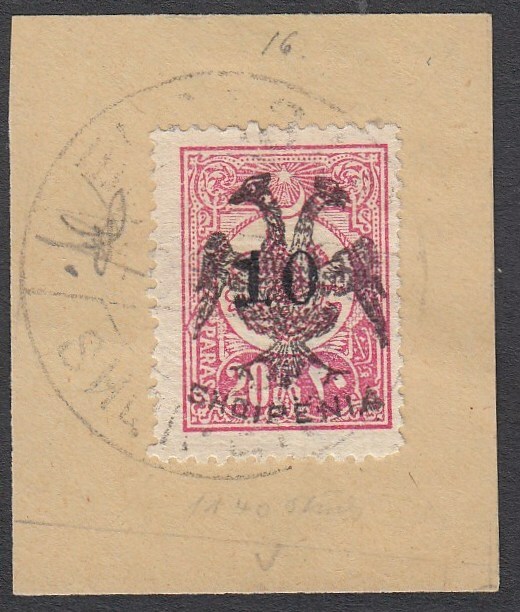 1904 cover sent from Berat to Germany, correctly franked with Turkish 1pi stamp tied by bilingual 'BERAT' cds. 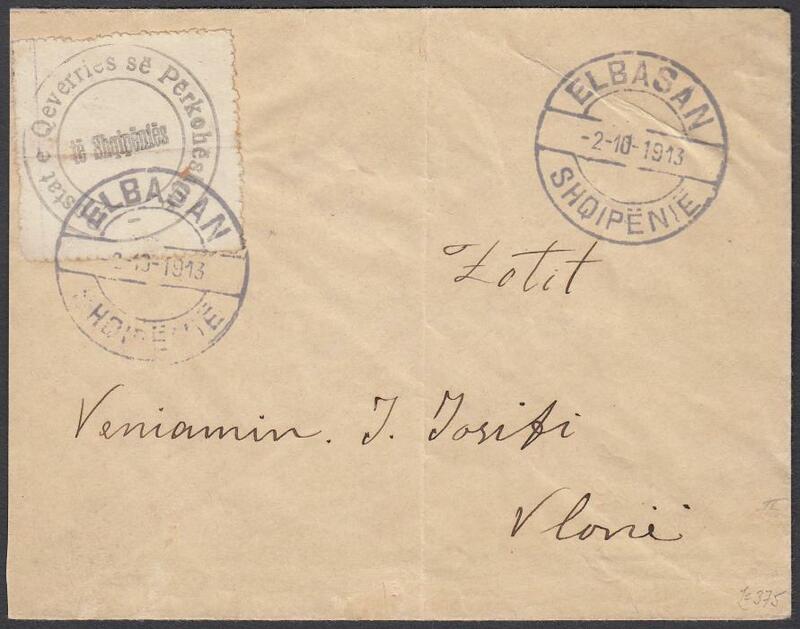 1906 cover sent from Berat to Trieste, franked with pair of Turkish 20 para stamps tied by bilingual 'BERAT' cds - correct rate. 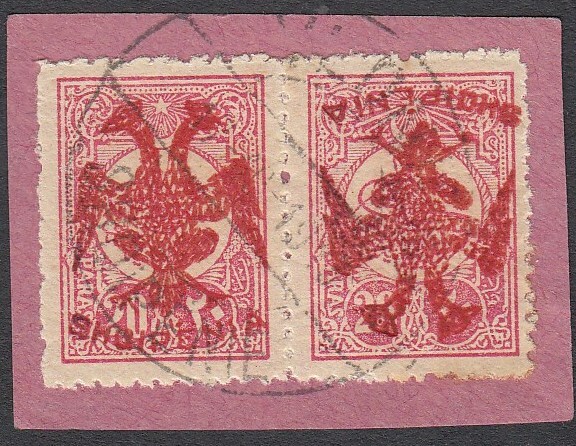 1913 (1gr) Official seal of PTT, without Coat of Arms, rouletted label (hoirzontal crease before attaching), single franking on cover (vertical fold) from 'ELBASAN/2 10 1913' to Vlone with 'QUKES' transit '3 10 1913' on reverse. Michel names 14 Oct. as the first day of usage. 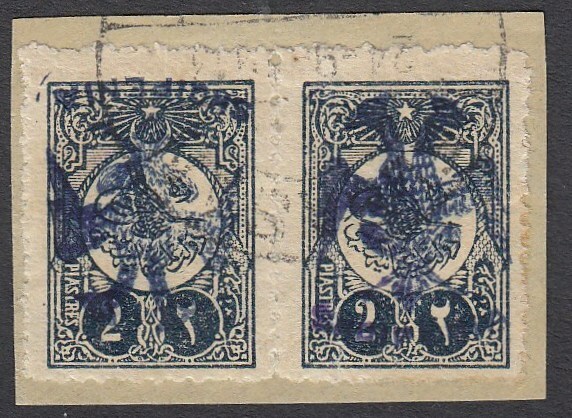 1913 Double Headed Eagle Overprints 2pi blue-black, horizontal pair with blue overprint, on left stamp inverted, on piece neatly cancelled, slight toning at right, signed Dr. Rommerskirchen BPP. 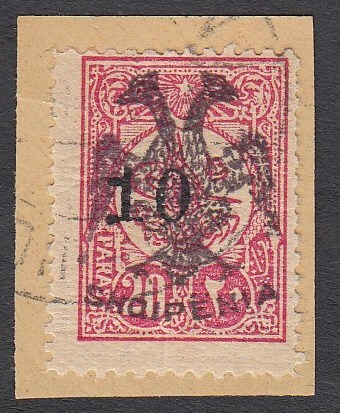 1913 Double Headed Eagle Overprints, 10 on 10pa rose, on piece neatly cancelled by full strike of 'ELBASAN' cds, signed and notice Mikulski. 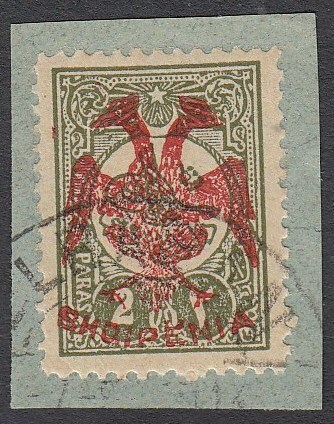 A very scarce stamp! (Scott 19). 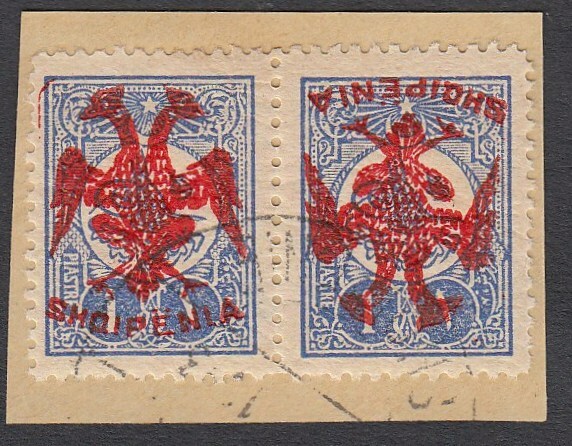 1913 Double Headed Eagle Overprints, 1pi pale blue with red beyiye overprint, on piece neatly cancelled, signed Dr. Rommerskirchen BPP etc. 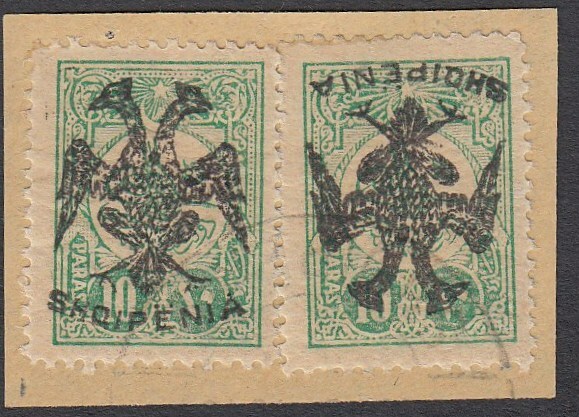 A rare stamp! (Scott 15). 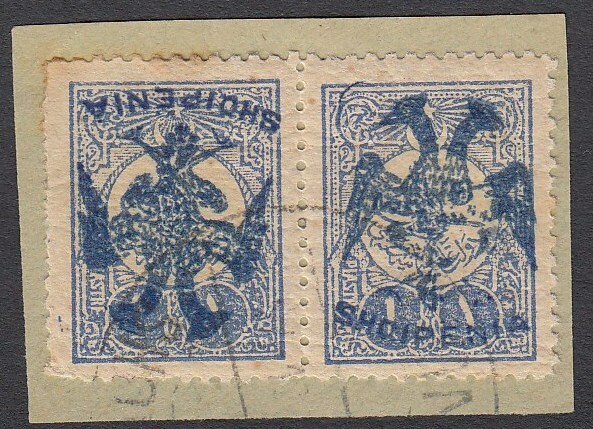 1913 Double Headed Eagle Overprints, 1pi ultramarine, horizontal pair with red overprint, on right stamp inverted, on piece neatly cancelled, signed Holcombe. 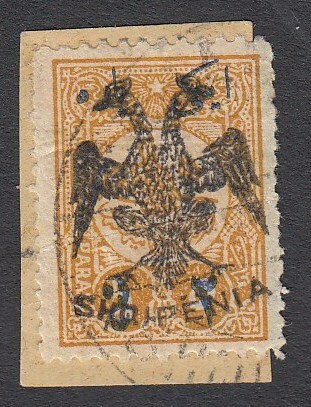 (Scott 7 var). 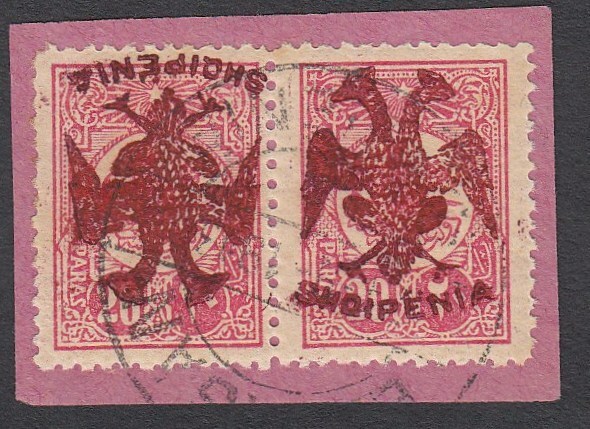 1913 Double Headed Eagle Overprints, 2 pa olive green with red overprint, on piece neatly cancelled, signed and cert. Holcombe. 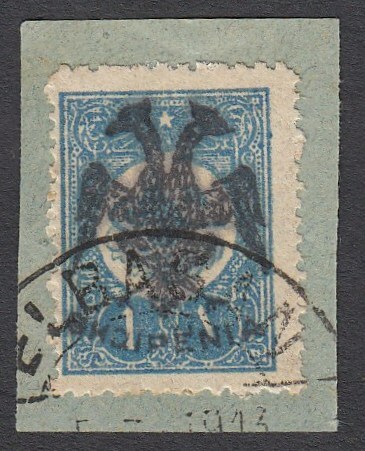 (Scott 17 var.). 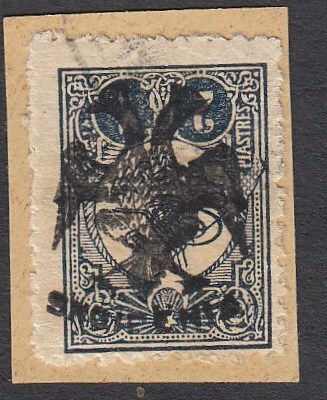 1913 Double Headed Eagle overprints, 2pa on 5pa ochre, on piece, neatly cancelled, signed and cert. Holcombe. 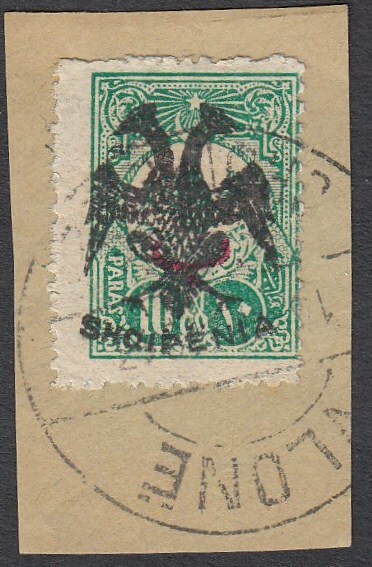 A scarce stamp!